Before we see Emily's fabulous project for today, let's spread a little joy...shall we? Linda, please send an e-mail with the subject "Authentique Paper/Helmar Week Giveaway Winner" and include your US or Canada mailing address to info@authentiquepaper.com to claim your Authentique Paper prize pack! To find out the winner of the Helmar giveaways, please visit the Helmar blog. I decided that I also wanted to play with the new "Miracle" collection. It's beautiful, right? While I was walking around the craft store I found the most adorable little wooden frames for $1 and I had to get them! They screamed "MIRACLE" to me! When altering wooden frames, it's a plus to have the perfect glue for the job. I've tried several glues and a lot of them will warp your paper. For this frame I used Helmar's Professional Acid Free Glue and it worked GREAT! All I had to do was spread it on my frame with a little foam brush and my paper stuck right to it! This glue dries fast though so not enough room to wiggle if you need to re-position your paper! I also used Helmar's Zap Dots to pop up the titles on these frames. LOOOOVE these little dots! And they come in different shapes and sizes as well as in black and white! 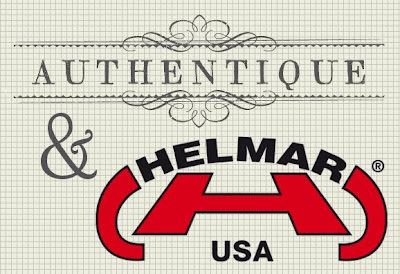 I hope you enjoyed all of the fabulous Helmar/Authentique projects this week - please be sure to head on over to the Helmar blog to find out what the talented members of their Design Team have created! Adorable frame, love it! And also a sweet card! Love the frame. I was actually going to get one today to alter. Too funny. Thank You For the Win!!!! I love Authentique!!! Congrats Linda! So many great projects and products! Wonderful! Just loving the projects! So creative!